Allen was born in Danville, Virginia, November 4, 1937, the only son of Bernard and Beatrice Mills. Raised just outside of Danville, his parents worked at Dan River Mills and farmed, raising tobacco. In the 1940's, he has vivid memories of resting with his father after lunch and listening to Charlie Monroe's Noon Day Jamboree on WSJS Radio in Winston- Salem, NC or WBIG Radio in Greensboro, NC. He remembers his dad driving a 1932 A Model to see Charlie Monroe at a Martinsville, VA school in 1942. In about 1953, he bought a Bell Comet mandolin in a local pawn shop. He began learning to play with school buddies. In 1955, he joined the Navy. He became friends with David Antonacci, who lived new Wheeling, WV. He went home with David one weekend and they wen to the WWVA Wheeling Jamboree. There he saw the Obsorne Brothers with Red Allen. After an honorable discharge from the Navy in 1957, he had six years as a reservist. Returning to Danville, he purchased a new Gibson A50 mandolin for the sum of $90.00, but never learned to play more then rhythm. In the 1950's, Allen played rhythm mandolin at dances in the Gretna, VA area. One night, the band had no bass player. So, an uncle knew someone that has a bass for sale in Rocky Mount, VA. The uncle took him to get the bass, a 1947 C1 Kay and loaned him the $50.00 to buy it. 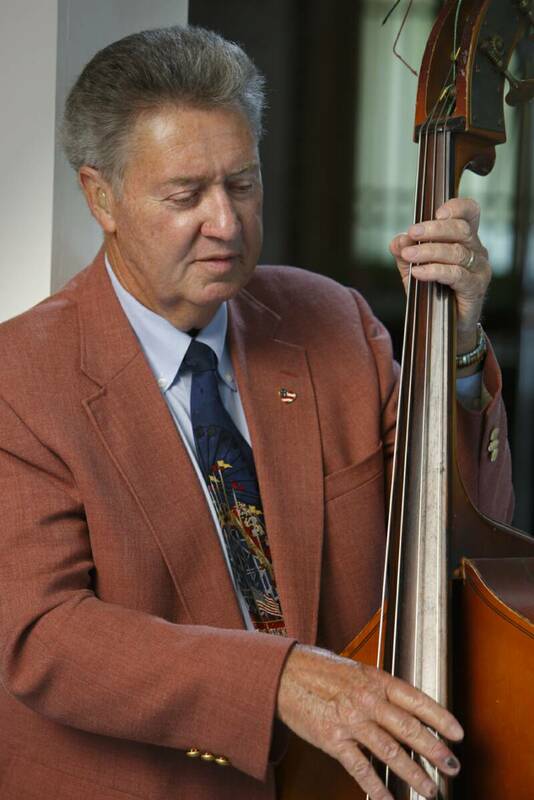 He began playing local dance gigs, which was a regular weekend event in the 50's and 60's. In 1959, the dance band has a regular live spot on WMNA Radio in Gretna, from 4:30 -5:00 P.M. In 1960-61, The Easter Brothers from Mount Airy, NC were living in Danville. Allen began hanging around them some. They were doing radio shows on WBTM, which was a larger station in Danville. He asked if he could sit in with them and they kindly consented. He later traveled locally with them and eventually was asked to join them for a recording session in February 1961. They recorded eight sides for King Records at King Studio, in Cincinnati, Ohio.. In 1962, he teamed up with another dance band consisting of Bobby Adkins, Charles Adkins, Wayne Scearce, Ryland Hawker and Doug Emerson. This band recorded one 45-rpm record that Carlton Haney put out on the Reno- Smiley label. The titles were Trading the Blues and Big Wheels Rolling. They worked in Danville area and within about a 50- mile radius doing weekend dances. Eventually, they were asked by Homer Thompson to perform on the WDVA Barn Dance, a Saturday night show at the Danville fairgrounds. They did this from 1964-1967. A highway project closed the fairground area, so the band took a hiatus from 1967-1969. During this time, Homer Thompson bought the old Timber Truss building on highway 58 East of Danville, had it totally renovated with an office, a stage and a dance floor for 1000 people. The Band became the Country T-Birds, playing the latest country hits by adding steel guitar, electric guitars, and drums, reserving the banjo and fiddle for square dances. Gene Parker came to work as the banjo player during this time. The new building was called T-Bird Country and hosted country acts such as Jerry Lee Lewis, Dolly Parton and Porter Wagoner, Charlie Walker, Ray Pillow. Clyde Moody and Jimmy Martin ( who's banjo player was Alan Munde.) The group played as house band and backed up many of the country acts. Gene Parker left the T-Birds in 1972 and Allen left in 1973. Allen was by this time living in Martinsville, Virginia area, and in the late summer of 73, at Gene's suggestion, he agreed to jam with friends. This is when he first met Dempsey Young. Allen, Gene, and Dempsey and Marvin McDaniel honed a few tunes. Allen asked the new Martinsville cable TV station if they would be interested in bluegrass music show. Their response was positive, and in mid October, for lack of a better name, The Lost and Found became the band;s name. Marvin was't interested in doing TV, so Roger Handy, a friend of Gene and Dempsey's, became their guitar player. They recorded their first album in 1975 First Time Around, followed by Second Time Around and Third Time Around in 1975-1978. In 1980, they recorded their first Rebel Album. They were the first artists that new owner Dave Freeman produced for the label, with whom they are still affiliated. The 1980's produced Endless Highway, Sun's Gonna Shine, The Deal, Hymn Time and New Day. 1990's produced January Rain, Just Picking, and Ride Through the Country. In 2002, They recorded It's About Time which produced a Bluegrass Unlimited #1 song, Johnston's Grocery Store. Allen does all the booking and bus maintenance for the band and has been full time with it since 1977. They still travel extensively from coast to coast and Canada. Allen moved to Patrick County, Virginia in 1981 and still resides there today. On a more personal note, Allen and Debbie Mills were married on March 16, 1979. They have one Daughter together, born on Allen's Birthday. They have one Grandson, Zacrye, who has become the light of their lives.